From Monday, April 8 to Wednesday, April 10, Albion College students will be able to vote for students running for Student Senate seats. Students will also be able to vote for the Senate’s next president and vice-president. 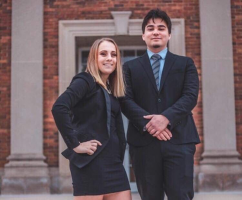 Jim Takeshita and Courtney Lamrouex are running together for president and vice president. Latrell Crenshaw and Tasi Martinez are running together as well. Jim Takeshita is a sophomore from Novi, Michigan with a major in Public Policy. 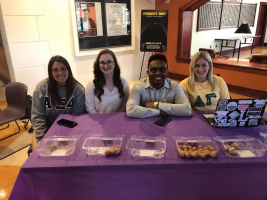 He is the previous treasurer of Albion’s Asian Awareness Group, an active member in the Albion College Democrats and a member of Tau Kappa Epsilon. He has been a member of Student Senate for two years. Jim, who is involved in Albion’s Martial Arts Club, originally joined Student Senate when he noticed that there was no punching bag in the Dow Recreation and Wellness Center. Takeshita also explained that his interest in public policy was what brought him to Albion College. As a member of Student Senate, he has been involved in reworking the tenure review system and is on the Facilities Task Force. His vice presidential candidate, Lamrouex, is a sophomore and member of Alpha Xi Delta Sorority. She is a member of the Ford Institute and has a major in political science. On Student Senate, she is the vice chair of engagement and chief of staff, which means that she deals with the day-to-day issues of the Senate. Latrell Crenshaw, who has been a member of Student Senate for one year, is a sophomore from San Diego. He is also a member of the Ford Institute, a tour guide with the admission center, an overnight host, as is the president of the Investment Club. As an out-of-state student, Crenshaw believes that he has a unique perspective to bring to Student Senate. Crenshaw also addressed concerns about his experience. He explained that he brings experience from the variety of leadership positions he has had on campus, helping him to understand the different perspectives of student needs. Crenshaw explained that this impacted his choice in running mate Tasi Martinez, a sophomore from Gladstone, Michigan. Martinez is the chair of the engagements committee. She is also a member of AZD, works as a tour guide and works as a teaching assistant and plays for the softball team. Takeshita said that he would like to see continued fundraising for student housing on campus by the Chair of Academic and Student Affairs. He would also like to work with Facilities to upkeep some of the older residential buildings. Crenshaw also mentioned the fundraising for a new dorm to be built, and to help improve existing dormitories on campus. Crenshaw would like to focus some of the budget from the Student Activity Fee towards fixing some of these issues, like getting new shower curtains and appliances. Takeshita would like to see that student input is honored by Bon Appetit, Albion’s food service provider. He explained that a new feedback program includes surveys and text message commentary. Takeshita is also concerned with making sure that dietary needs and restrictions are being met. Crenshaw feels that there is more Bon Appetit could be doing to make their food more consistent. Takeshita said that he has heard both positive and negative things about the Oaklawn transition. One of the large issues with Oaklawn is that out of state students who apply for health care in Michigan might not be covered when they get home. If elected, Takeshita would like to focus on working with Oaklawn to distribute correct information to students, and to make sure that free and reduced health care options are available to the public. He cited the Fountain Clinic as an example of this. Crenshaw has created a Student Senate subcommittee on health care and is currently in the process of distributing a survey to students about the Oaklawn transition. As an out-of-state student, Crenshaw believes that he has an important perspective to add to the conversation about health care on campus. He explained that so far, the committee has met with Oaklawn executives, but with mixed response from students who felt that not enough of their concerns were answered constructively. A concern that many students have is how much pull Student Senate has with Albion College’s administration. Takeshita said that the Board of Trustees is open at times about issues brought before them by Student Senate, but sometimes the Board was not. He believes that this lack of openness is due to lack of information about student life rather than malice. In working with the Board of Trustees and Administration, Crenshaw wants to make sure that he focuses in students’ needs first. Takeshita would like to see an increase in Student Senate’s subcommittees roles. Instead of consolidating issues like healthcare and the environment into the Senate’s two committees, Takeshita wants to see set sub-committees. Crenshaw believes that Student Senate could do a better job reaching out to students, and, if elected, would like to see more incorporation of students into the Senate process and to make Student Senate more visible. He also believes that it is important to see more correct communication across campus.